Next, if you don't what what the different types of transformations are, do a web search and find out . Yup, open a new tab in your browser and search for it﻿. Before you start, try moving the slider (the black dot on a line directly under the word "vector") left or right. Don't worry about what a vector is for now (or google it if you must know); just have fun moving the slider. Seriously, have fun with it. Like, smile and stuff. The brown shape doesn't move: this is called the preimage. The preimage is the shape that we will be translating (because it's "pre" translation). The pink shape is called the image, because it's the "image" of the preimage after transformation. Preimage = before transformation (brown), and image = after transformation (pink). Kapisch? 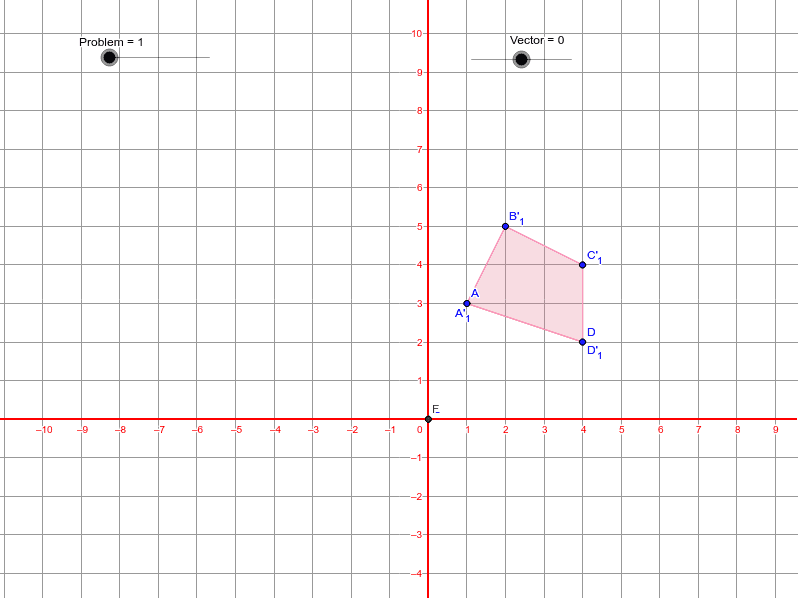 a) Translate the polygon so that point A is at (5,3). How far did the polygon move from its original position? b) Now translate it so that point C is at (0,4). How far did the polygon move from the last position? c) Is this a horizontal or vertical translation? Check your answer, then go on to Exploring Translations 2.